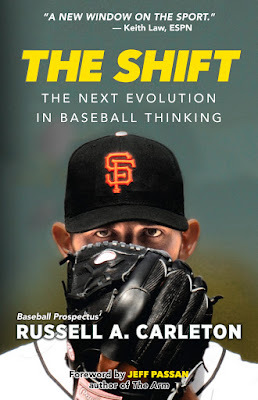 Brooklyn Digest: A Look At New Mets Analytics Guru Carleton's Book "The Shift"
A Look At New Mets Analytics Guru Carleton's Book "The Shift"
Baseball has always been a game of numbers. Mention Joe DiMaggio’s 56, Hank Aaron’s 755, and Cal Ripken Jr.’s 2,632 to avid baseball fans, and they will know instantly you're referring to how many hits Joe D. had in a row, Aaron's career home run record, and Ripken's consecutive game streak. Carleton writes of how much you can analyze this game, "Baseball is a game. Games create their own ecosystems. Over time, all ecosystems change, even if we don't want them to. "There's a lot of downtime in baseball, which means that there's a lot of time for incubating the tiny mutations that can shape the game. It takes three hours to play one game and six months of nearly daily installments to play a whole season. There's a lot of time to think, not just between each pitch, but night after night and plane ride after plane ride. A baseball season is more like a six-month mantra. There are a thousand little things that can happen over and over again, and you can pick any one of them to fixate on as you meditate. You can think about the implications of throwing a fastball vs. a curveball in a thousand different situations, and it's not entirely academic to obsess about it. The pitchers on your team have to make that decision a thousand times in the space of a week, the same way that they had to the week before and the week before that. A game and even a season could turn on any of those pitches. "Baseball is a thinking game. Maybe it's even an obsessing game. It is most certainly a shifting game." Carleton writes of seeing the shift in action on Memorial Day in 2014 at when David Ortiz of the Boston Red Sox came to bat against the Atlanta Braves game and what went through his mind, "If there's one thing that David Ortiz did that most changed the game of baseball, it might have just been that he was left-handed. It was well-known during Ortiz's career that he was a pull hitter, especially when he hit the ball on the ground. In fact, his pull tendencies were so well-known that in the mid-2000s, teams would routinely shift their infield-defense when he came to the plate. Instead of lining up in a traditional formation with two infielders to the right of second base and two to the left of second base, Ortiz would often see three infielders on the right side of the infield, while the lone left-sided infielder would play in the space normally occupied by the shortstop. "It made sense. If Ortiz was going to hit his ground balls mostly to the right side, why not put an extra defender over there? This Sicilian defense had originally been deployed in the 1940s on another iconic left-handed Red Sox hitter, Ted Williams, but it left and obvious hole. The third-base line was completely unguarded. The nearest defender was playing 40 feet off the chalk. A ground ball hit anywhere near the line would have no trouble scooting through to left field for a hit. In fact, even if it didn't make it out of the infield, by the time a fielder got to it, even the slow-hoofed Ortiz would have been standing on first, the proud owner of a single. Everyone in the ballpark, including Ortiz himself, could see that. "'Why doesn't he just bunt?' is the kind of question that seems easy to answer, but isn't. It's a good exercise in thinking a question all the way through. The most commonly given answer was that Ortiz was a power hitter paid to hit home runs, something that he did 541 times over his career. Bunting was for the weak. Bunting was something that pitchers did when they had to bat. No matter what else bunting meant, ordering Ortiz to drop a little tapper toward third meant that he wouldn't be hitting a home run in that plate appearance. "There was plenty of initial resistance to the shift for the same reason that there's opposition to any shift in thinking: it was weird. Pitchers grew up in a world where defense lined up in a two left-two right formation. Consciously and unconsciously, over years of repetition, they had tailored their strategies to this set of assumptions. Sure, teams had a long history of moving their fielders a jump to the left or a step to the right depending on the hitter, but moving a fielder 30 or 40 feet is a very different proposition. "There was psychological resistance too. Loss aversion rears its head again. The shift inevitably produces a ground ball hit directly at a fielder who is playing in an odd place. It would have been a base hit if the team had lined up in a traditional formation, but with the shift on, it's an out. Success! The problem is that the shift also produces a few ground balls that scoot through into left field exactly past the place where the third baseman would 'normally' have been playing. Mathematically, as long as the shift is producing more outs-that-would-have-been-hits than it does hits-that-would-have-been-outs, then it's a net winner. Unfortunately, that's not how the human mind works. Humans are more disturbed by 'losing' an out that they have had than they are by gaining one that they otherwise would have gotten. The shift felt icky, but baseball eventually embraced it." "Finding the places where the individual ends and the team begins in baseball is trickier than it is in other sports," writes Carleton. "On a baseball team, 25 grown men must learn to play a game together, even though most of the time they are only minimally interacting with one another. In sports where any of the players can score at any time, one or two players can carry the load. In baseball, the lineup dictates who will bat next and the calendar determines the day's starter. Anyone, however, might be thrust into a key situation. Everyone has to be ready. Baseball is a very democratic sport." The Shift is equal parts Moneyball and Malcolm Gladwell. Through Carleton's storytelling, with humor and clarity, this great new title has the power to make baseball nerds race to grab some hot dogs in the nosebleeds while transforming bleacher bums into statisticians.